This years voting for sessions at VMworld 2013 have just begun and as lots of other people, Purevirtual also have a session proposal. Together with products from VMware, vCO and vSphere we will will walk you through how vCO can be used to integrate Software Defined Storage and Razor (Razor should not be new to you, there are several articles covering Razor on our blog) to add very cool enhancements to your Software Defined Datacenter. Here´s how to vote for sessions at VMworld. First you need a VMworld account. Don´t have one? No problem. It´s easy to register an account (for free) at http://www.vmworld.com. When your account is ready go to http://www.vmworld.com/cfp.jspa to vote for you favorite sessions you like to see at VMworld this year. Hint 😉 Session 5472 is ours. 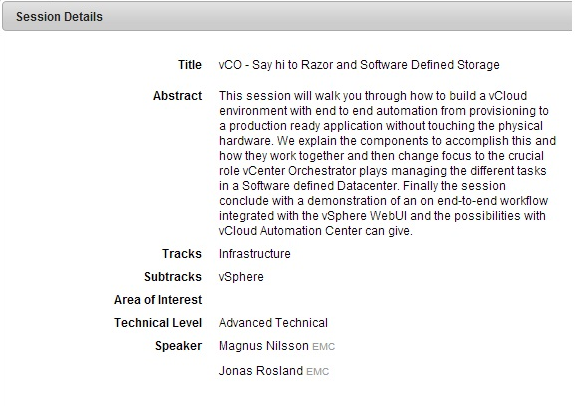 This entry was posted in Razor, VMworld and tagged razor, sds, vco, vmworld2013. Bookmark the permalink. What a great post I just loved it.